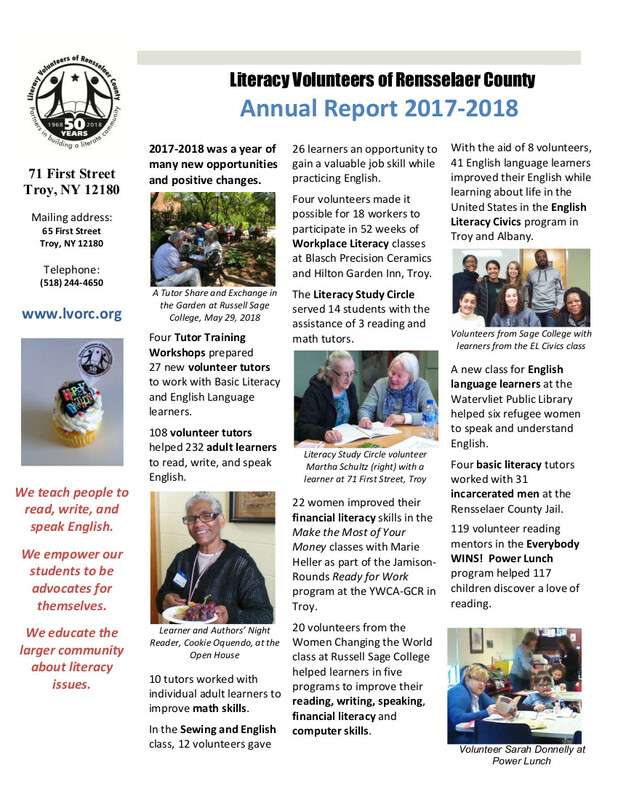 Each year, the Literacy Volunteers of Rensselaer County (LVORC) hosts a fundraiser called the Famous Ladies Tea, a luncheon designed to celebrate the successes of historic women and share the details and impact of their successes with a captive audience, all while raising money for their non-profit organization. As a volunteer with LVORC, I had the pleasure of attending the Famous Ladies Tea and observing the methods by which the organization seeks to continue providing critical service while adhering to the core sentiment of its mission statement. The mission of the LVORC is broken into three parts — to teach, to empower, and to educate. While the proceeds of this fundraiser are used to provide free literacy programs to children and adults, the fundraiser itself was a display of what the LVORC believes in and seeks to accomplish as an organization. The event is designed as entertainment, but the premise of the tea is to teach the actress about an important woman in history, to empower and embolden each actress by allowing them to embody these women and to share their stories, and to educate the audience by sharing the influence that each woman has had on history and what we can garner from these experiences. The mission statement of Russell Sage College, an institution for women, is also in three parts — to be, to know, to do. The opportunity to volunteer with an organization whose mission aligns so closely with that of my institution and to help with projects that seek to foster what I believe are important moments of connection and encouragement between women of influence is an experience that I will carry with me as I seek to apply these critical foundational actions–to be, to teach, to know, to empower, to do, to educate–to life after graduation. The LVORC provides a critical service to a population of learners who will value the knowledge that they acquire in these classes and conversations as they gain literacy and use it as a tool for life. But the leaders and volunteers at LVORC are learning just as much, with their work allowing for an exploration of the far-reaching impact of education and how individuals can play a role not only in their greater community, but also within the lives of one another.